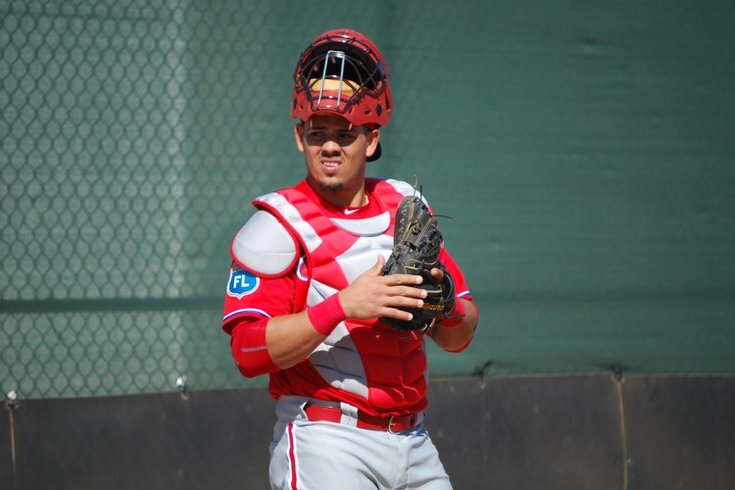 Jorge Alfaro, who worked with Phillies pitchers in Clearwater, Fla., this spring, was called up from Double-A Reading on Friday to temporarily replace Carlos Ruiz on the active roster. Winning in the minor leagues might not be the top priority for major league organizations – developing individual talent is the goal – but there is certainly nothing wrong with cultivating a winning culture. No team at any level in any league – major leagues or minor leagues, north, west, south, wherever – has won as many games as the Reading Fightin’ Phils. The Phillies Double-A affiliate improved to 51-22 with a walk-off win on Thursday afternoon at FirstEnergy Field. Perhaps the most impressive part of the Fightins’ success is, like many a minor league team, they’ve kept on going despite losing premium talent. Shortstop J.P. Crawford, the top position player prospect in all of baseball, was promoted to Triple-A Lehigh Valley a month ago and right-hander Ben Lively, arguably the best pitcher in the Eastern League for the season’s first month, followed Crawford to the ‘Pigs about a week later. Velasquez 'back to normal,' but will he rejoin Phillies next week?Velasquez 'back to normal,' but will he rejoin Phillies next week? And yet, Reading continues to win. One of those assets has had his own work cut out for him in adjusting to the ever-changing Fightins’ roster while developing his individual game, too. Jorge Alfaro, arguably the top prize of the trade that sent Cole Hamels to the Texas Rangers 11 months ago, was behind the plate for each of the last two games in Reading, where the Fightins watched the team's 11th and 12th different starting pitchers take the mound. The Eastern League season is just 11 weeks old. 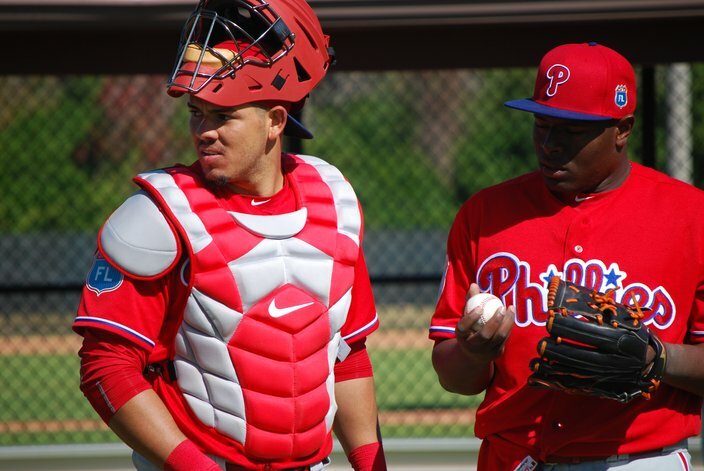 Jorge Alfaro, in spring training with Hector Neris, hitting .301 with seven home runs and an .800 OPS in 46 games this season for 51-22 Reading. Alfaro could have gone 0-for-4 with four strikeouts (he didn’t, he went 0-for-3 with a walk and a strikeout) and words like those from his pitcher would have made his night. Alfaro, who turned 23 earlier this month, obviously takes pride in his personal performance. But he’s a catcher who understands his role and how crucial his everyday job is in getting the most out of his battery mate. If that sounds familiar, it’s almost exactly how most people would describe the man who has crouched behind the plate at Citizens Bank Park for the last decade. Carlos Ruiz is first and foremost a pitcher’s catcher (and Roy Halladay’s security pillow). Alfaro said as much before a recent game in Reading. When asked in general how his overall season was going 2 1/2 months into 2016, Alfaro didn’t sound like a prospect enamored with his impressive toolset, but, instead, sounded like a catcher. Alfaro, a native of Colombia, had the opportunity to learn under Ruiz throughout his stay in big league camp in Clearwater, Fla., this spring. He continues to work with Phillies minor league catching coordinator Ernie Whitt regularly and also has Wathan, a former catcher, to learn from daily. While his raw power is his top feature on offense, Alfaro’s defensive tool is a right arm that made some people recall Ivan “Pudge” Rodriguez when he was coming through the Rangers farm system. Alfaro has thrown out 20 of 45 would-be base stealers this season; that 44.4 percent success rate (albeit in the Eastern League) would put Alfaro fourth in the big leagues, behind Buster Posey (57 percent), Salvador Perez (61 percent), and J.T. Realmuto (50 percent). But catching entails more than developing a strong rapport with your pitcher or controlling the running game. There’s game calling. And blocking. And framing. And his grades so far? Wathan loves the way Alfaro has worked with the aforementioned ever-changing pitching staff and his ability to call an effective game no matter who is on the mound. Wathan would like to see some improvement in receiving. “He still needs work on balls down and in to (right-handed hitters),” Reading’s manager said. “That’s kind of the toughest pitch for catchers to catch. Especially with lefties. He’s got some guys here who throw pretty good cutters. So he gets caught a few times there, sometimes a little bit off-balanced on breaking balls, he’ll fall forward a little bit. But he’s getting better at it. He works hard at it. Alfaro has already logged more innings behind the plate in 2016 than he did last year, when he missed most of the season after undergoing ankle surgery. After missing a year of development, Alfaro is back on track and eager to get to the field each day to continue his catching education.